The collection expresses my signature style which is defined by my love of naturals and my precision in using them is prevalent in all my creations. Le Jasmin ~ Inspired by "an exotic garden in Morocco, late October just before the sun was falling." With lemon, bergamot, mandarin, rosemary, lavender, jasmine, orange flower, ylang ylang, cedar, oakmoss and musk. Tuberosa ~ "Dedicated to the tuberose flower, this is the epitome of contemporary elegance. Intoxicating notes of Indian tuberose flowers intensified with indole salicylates fused with fruity udertones of jasmin sambac, a twist of orange flower and exotic fruits resting on a base of musk, balms and resin to give perfect harmony and longevity to this enchanting fragrance." Additional notes include benzoin. Veti Vert ~ "A signature scent with notes of smoky vetiver and oak moss. Grounding, earthy and smoky with undertones of grapefruit and asparagus. Vibrant top notes of grapefruit, bergamot and petit grain with a heart of vetiver. The vetiver accord; vetivert Haiti, vetiveryle acetate, oakmoss and iso butyl quinolene entwined with patchouli and santal grounded by soft top notes of tonka bean, nutmeg and musk to complete this great masterpiece." La Feuille ~ "A unique Chypre; fruity, green and unforgettable. Inspired by the change of seasons, hearty oak leaf, earth moss and a compote of red berries combine to form a unique fragrance, that is redolent of the changing seasons." Additional notes include ivy. Verger ~ "A crisp autumnal fragrance reminiscent of ripe orchards and the last days of summer.Rich colours of autumn ; red, green and earth tones. Sweet and sour olfactory notes. Galbanum and grapefruit fused with wild apple accord; damascones, basil and green leaf. A heart of metallic rose and hints of rhubarb to intensify the theme, surrounded by an earthy vetiver, oak and patchouli." 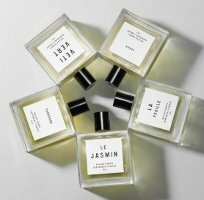 Miller Harris The Perfumer's Library Le Jasmin, Tuberosa, Veti Vert, La Feuille and Verger are £195 each for 100 ml Eau de Parfum.